What Lovely fabric! And the Homes pattern is wonderful! I love reproduction fabrics…they’re too good not to share! Thank you for the free pattern. I’m making mug rugs today and the pattern will be used!!! I would love to win if it is to be. I follow daily and enjoy your blog!! Thank you for the chance to win the fabrics. Thank you also for the free pattern. At my house, your UFO’s are called “PIGS.” That’s Project in Grocery Sacks. How can I be expected to finish them when you keep coming up with such incredibly neat patterns? I really like the wintry house pattern; that one is going to have to take precedence over all of the other “stuff” I’ve got in the works. Thanks so very much for sharing your talents! Bill, you gave me my laugh for the day! I love PIGS, what a great name! Wow…I love thirties reproductions fabrics! They remind me of all the quilts my maternal grandmother and her sisters pieced and quilted by hand. Plus, I would be thrilled to have a hard copy of the Tree Trimming pattern. It is on my list of projects to try. Thanks for offering this opportunity! I love reproduction fabrics, too! I have been fortunate enough to work on several quilt tops my grandmother had. They’re the real deal and I absolutely love them! I can imagine this pattern being sewed in gradations of batiks, in addition to the 30s repros. It is a beautiful design. I have seen it in batiks, it was lovely! I taught this pattern as a class for about a year and almost all of the fabric choices were unique and all were equally wonderful! Tree trimmings is so sweet in the 30’s repro’s. Like the “snow” on your blog (much more than the real stuff). 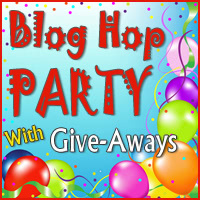 Is there any order to the Blog Hop Party? How will we ever get anything done with over 200 to visit?? Thanks so much, Sharon! I love repo fabric…I don’t use it nearly enough! What a great giveaway! Thanks so much for the opportunity 🙂 I am hosting one too! Oh, awesome, I’ll have to go see! You are such a creative, talented, and giving woman. Thank you so much for all the work you do for the crafting world and, of course, for TTMT! Love the pattern and the vintage repro fabrics. Thanks for the giveaway. I can’t wait to win! HA! What a great collection of repros! So many of the quilts from my grandmothers had the real thing in them; it is neat when I find copies of the originals. The pattern is neat too – no wonder it is a top seller. Thanks for the opportunity!! Thank you for the sharing the pattern for the lovely block. It would be a nice addition to a holiday quilt. This is the first time I have entered my blog in a Blog Hop. It’s been fun visiting other blogs and having people leave comments on mine. I enjoy receiving your blog updates in my email. Thank you for the free pattern. I love the give away pattern and the fabric is a bonus. Lovely pattern and fabric – I would like to win that! I love reading your posts and checks it out every day, but the other day I thought I was ill or loosing my eyesight: the letters were unclear and flicking…. that was untill I looked at a photo and found out that it was snow. As if I had not notised that christmas was near 🙂 Thank you for writing this blog! Thank you for the cute pattern. It will surely make a cute quilt. Your giveway is one to die for. 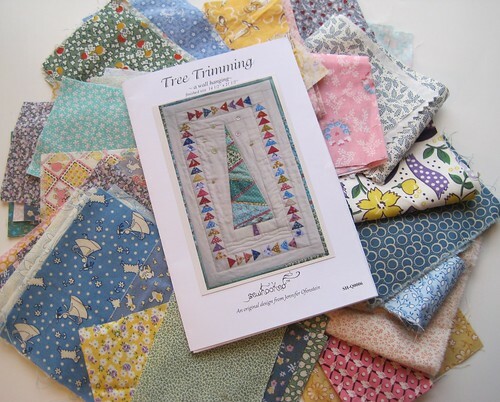 A chance to win the Tree Trimmning and a grab bag of repro fabrics. Yes, this is a Santa Claus. I look forward to your blog, every day and I, too, enjoyed the photo with the snow . Very cute and clever of you. I hope you have a wonderful and safe holiday. What great fabrics – thank you! and thanks for the free pattern, I’m off there now! This is adorable fabric & pattern! Whether I win or not, Happy Holidays to all! Wow the fabric looks like some of the old flour sacks I have that were Mom’s. Takes me back to when I was very little. What wonderful fabrics and a great pattern. Thanks too for the house pattern. Beautiful fabric, Wonderful pattern, thank you for offering these in a great giveaway! Your tree pattern is darling! If I don’t win you can bet that I’ll be buying one. Thank you for the chance to win. Lovely fabrics and pattern! Thank you for the give-away! Love the fabric and the pattern is sweet. Thank you for the chance to win. What a great giveaway. Thanks so much! lovely fabrics to go with a great pattern. Thank you for the house pattern. I just love 30’s prints. Thanks for the chance!! I’ve only recently started quilting, but I already know that I love reproduction fabrics. The pretty florals & cute kids/animals/etc are awesome. I love anything vintage, so these fabrics are perfect for me. Thanks for the giveaway! Thanks for a wonderful giveaway! I love your pattern. It would be fun to make it for next Christmas. Again, thank you! What a lovely fabric pack and a cute pattern. Thanks so much! I love it! Your Tree Trimming pattern and repro fabrics are very lovely as well – my fingers are crossed! Love the pattern & reproduction fabrics. What a great giveaway. Thanks for the chance to win. I’m a collector of repros and the ones you’ve shown are fabulous. Thanks for sharing the house block and using the repros would be m..a..r..v..e..l..o..u…s! Thanks for a chance to win! I love the repro fabrics. Thanks for the pattern and chance to win! Merry Christmas! Thank you for the free pattern and lovely fabric! Great giveaway! I love the pattern, and beautiful fabrics too. That is a lovely giveaway. The house pattern looks like a fun one to make. Thank you for the free pattern! I love reproduction fabrics, I really hope I am the lucky winner! Great give a way and fun blog! Hi Jennifer I’m hopping! Love your blog and will be back! lol! See ya later! Lovely fabrics, and the tree pattern is adorable! Love your tree pattern! And the fabric is gorgeous too. Thanks for entering me in your draw. I love 30’s fabrics. I could see myself using every bit and piece. Thanks so much for the great giveaway chance! those fabrics are delightful and could be used in my GFG quilt! I need a great winter quilt pattern and this one would be great. Lovely give away you have here, thanks for the opportunity! I am participant in this give away too, so you might visit my blog too. Kind greetings from the Netherlands. I don’t have any 30s prints so would love these. Thanks for the chance. What gorgeous fabric and I love the house block. Right up my street LOL! I also like the geese round the Christmas tree. Lovely pattern. Love your giveaway and have already printed out your free pattern for the Holiday House! Thanks so much for your generosity! Thank you for the wonderful giveaway!!! Amazing!!! My first time at this….cute little pattern! Oh my, I love the repo fabrics. I would love to put them to good use. Love the fabric! And the pattern will make a great project for me to get ahead of the game for Christmas 2012. Thanks for the very cute pattern 🙂 Thanks also for the chance to win these wonderful fabrics I love the reproduction fabrics. Thanks for linking to the paper pieced pattern. The fabric is beautiful too. thank you for the pattern. love your giveaway. Hello, I am your new follower! I really like this free pattern! Thanks! Love your pattern and the little quilt at the top. Merry Christmas! I love the pattern and fabric choice. What a fun holiday prize. Merry Christmas! What a lovely giveaway. The fabrics are wonderful and the pattern is just lovely. I would like to be able to make this. Awesome giveaway!!! Thank you for the chance. Love, love, love it ALL. Thank you. great pattern! and love the fabrics … a great prize! thanx muchly for the opportunity to win! Your prize is so nice reproduction fabrics are always so much fun to work with. Thank you for the chance to win. I like your pattern! Thanks! Would love to win. the Fabric is my favorite. The pattern is so cute. I made your Sweet Sue pattern from the Celebrate Christmas QAL and made mug rugs with my finished blocks. Sweet Sue was a favorite amongst the ladies that I gifted the rugs too! I love 30’s fabrics, thanks for the chance to win. What a generous giveaway. If I were to win, I would use some of the fabric in my “Dear Jane” blocks. Thanks for the opportunity to win. The pattern is great, and thanks for the free one! The fabrics are lovely! Thanks for the chance! What a beautiful pattern! The Greylag Geese are here in large numbers (Orkney) so this would be an appropriate pattern for here. Thanks for the opportunity. Gorgeous pattern and love the fabrics. Thank you for the chance to win. Thanks for the sweet pattern. I am such a fan of the reproduction fabrics and love quilts made from them. Love the pattern and the fabric. Thanks for the opt. I just love the pattern. Thanks for the chance. Love your patterns! Thanks for the chance to win your great prize! Thanks for the cute free pattern – they make great Christmas cards! Thanks for the lovely giveaway too – Happy Holidays! Thank you for the free pattern …. I’m not very good at paper piecing but this pattern has me wanting to keep trying. Your giveaway is just swell – thanks for the chance. Your prizes are great! Thank you for a chance to win. Great pattern, thanks for the chance. I’m totally in love with your giveaway!!! Oh YEAH! I LOVE reproduction fabrics. 30’s are SO neat! So much fun to look at. Hope I can win. Love the Tree pattern too. I can see what it is your most popular pattern. I love your pattern, and the repro fabrics. Thanks for the chance to win! I am in love with thirties fabrics! They are so cute! Thanks for the giveaway. I just love the reproduction fabrics. Both the fabric and the pattern are lovely! Thank you for the wonderful giveaway. I’ve been admiring tree trimming for a while; thanks for the chance to win! I am so ahppy I found sewhooked.com, Jennifer! You are so inspiring! Love the free pattern and what a cool giveaway – thanks for the chance! Love the free pattern. Thank you! But I really love the Tree Trimming Pattern. It is so cute. Did I leave a comment already? I’m pretty sure I didn’t, but I can’t imagine why! Anyway, I’d love to be entered for this giveaway. Don’t know how you do it–all these wonderful patterns (especially all the Sue ones)–do love Tree trimming as well! Thanks for the adorable pattern. Excellent giveaway! Love the fabric and the pattern. This blog hop thing is fun! OOOH WOW! My heart skipped a beat when I saw those fabrics. I love reproduction fabrics more than any other and I am trully a fabriholic. So thank you sooo much for giving these away. Great giveaway! I love the pattern and the fabrics are so pretty. Thanks for the chance! I love your pattern. Thank you for the wonderful offer. What a great pattern you are giving away. Thank you for the opportunity. I love your pp patterns!! I love trees too! Your pattern is AMAZING!!!!!!!!! Thanks for the giveaway! Thanks for the chance to win. I love that pattern….so cute! I would love to entered! Thank you so much for the chance!!! The fabrics are really nice, and I love the pattern. Looks like it would be perfect for an advent calendar, which has been on my to-do list for a while. Thanks for the giveaway! Merry Christmas and thanks for an opportunity in the drawing, the reproduction fabrics are some of my favs! First of all thanks so much for the paper pieced house…also for the chance to win the grand prize! Love those fabrics! Que maravilla de patrón y de telas!!!!! What a lovely giveaway. I’m keeping my fingers crossed. I love paper piecing. Thanks for the giveaway and pattern! Darling pattern and fabric! Thanks for participating in the blog hop. I am in love with the fabric you are offering – Thanks so much for the chance to win! Greetings from Hungary. Thanks for playing! I want to win. Beautiful fabrics, sew it on pillows. Love the fabrics and the pattern. Thanks for such a generous Give Away! Great fabric! Thanks for the chance to win. Thank you so much for the pattern, so nice. I love the tree pattern also. Wow what a great giveaway. Thanks!! The giveaway is wonderful! I would definitely use the items. I love reproduction fabrics so this is one fun giveaway. Thanks for the chance to win such a nice giveaway prize. Repro fabrics are my favorite. Thanks for the giveaway. I would love to have some reproduction prints in my stash! Thanks for the block pattern! The snow caps are so cute. It’s funny when I see 30’s prints, I think of my grandma who considered those the latest designs in her prime of life! We had quite a few quilts with these shades of prints; very homey. Nice pattern, I love flying geese. Thanks for this chance & your generosity. I LOVE your pattern – what a cute tree! And those fabrics are wonderful choices. I’m new to quilting and need to build a stash. These repro prints would be a great addition. And I love that pattern. Thank you for the lovely pattern and for joining the giveaways. I love the 30’s fabrics. I can never get enough of them for my scrappy quilts. I like the tree pattern with the geese. great combo. Reproduction fabrics are the best. This is a great giveaway. Thank you for the chance and Merry Christmas from Minnesota. Oh that is some gorgeous fabric and pattern. Sure want to make that. Thanks for the free pattern, looks like a good mug rug pattern. What a delicious giveaway of goodies! Thanks so much for this opportunity to win this giveaway of goodies and have a wonderful weekend! Thank you for hosting such a fabulous giveaway. I’ve been looking for an adorable tree quilted wall hanging to do because I don’t have room for an actual Christmas tree – so yours fits the bill. Your Classic Film pattern is superb! I’ve never seen anything like it. Definitely now on my to-do list. Oh, I would love to win your grab bag of reproduced prints. What a great giveaway. Love the little Christmas mugrug pattern. I have several friends that will like that. Thanks for your pattern! I would love to be in your giveaway! Beautiful gifts, thanks so much. Those repro fabrics would be fantastic! I’ve been replicating some of my grandmother’s quilts and they would go so nicely. Thanks for the opportunity! Love these fabrics and the tree pattern. 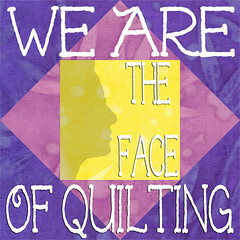 Thank you for the inspiration I needed for my Charity Quilters Group. Each child in the Hospital on Christmas morning is given a gift of a quilt to keep as their own. 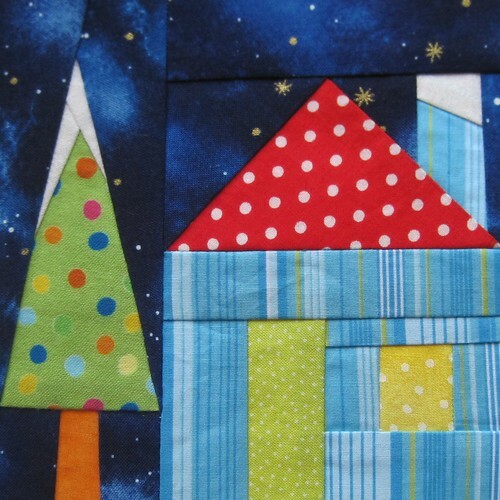 Your lovely block will be so pretty with it’s colorful Christmas Tree and House. It will bring so much joy to a sick child. I appreciate all your generous help. Now I better get started sewing——the Holidays will be here in a flash. What a happy square. Not usually impressed, but this one is soooo cute! I use reproductions all the time!! I like all kinds of tree patterns. I’m kind of new to quilting, and loving it. Love this and thank you for the house block pattern, Helen-irenebowie1@hotmail.com..I love all trees. Just ‘found’ your site and I like what I see. I’m new to quilting. Love the house block and the fabrics. I haven’t done too much paper piecing, however I’m willing to try more. THANKS for the free pattern. The house looks pretty easy for a beginner. I would love to win the tree pattern and fabrics. Love the tree, it’s beautiful! I love this pattern, I also love free things so draw my name! ! I love your UFO block. I’m now off to the sewing room to make a couple of pot holders using that block!! Also, reproduction fabrics are another favorite. I have a small collection that I’m trying to build up into enough for a quilt.